Quality Punch Bag This punch bag is made from the thick grade Vinyl (Rexion). The bag is carefully stitched and checked for every detail before it is filled to the highest standard. The design features a zipped top which can be opened/closed to increase or decrease the amount of filling. FREE Pair of Inner Mitts (random colour) and pair of Resistance band (random colour) with every punch bag as well as a free chain with a built in swivel which allows the bag to twist freely and absorb your punches and kick. When measured with the chain the size of the bag increases by another 12 inches. This bag is ideal for light to medium users and is one of the best bags on the market in this range. 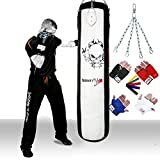 2 piece Wall Bracket This boxing bag set also includes a Wall Bracket made from high quality metal which has been specially shaped and made for punch bags. The product has been powder coated to give it extra life and make it weather proof and suitable for all environments. It can be affixed into wooden beams or drill fixed into other suitable places. The Bracket can easily hold up to and beyond 100 kgs. Chain You also get a free chain with a built in swivel which allows the bag to twist freely and absorb your punches and kick. This chain measures about 12 inches. The product is made to the highest specification and is quality tested and guaranteed. This has made it the choice of professionals and that is the reason we are supplying these to world class health clubs, gyms & Boxing clubs.